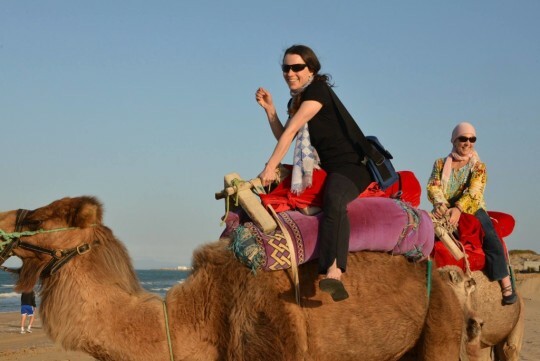 In mid-March, I was a member of the TechWomen delegation* to Tunisia. Tunisia is a beautiful country on the Mediterranean nestled between Algeria and Libya; a small piece of the Sahara Desert is in the South and the Northern part is greener than I expected with a temperate climate and lovely beaches. Nearly everyone I met speaks at least 2 languages (Arabic and French) and the Tunisian dialect of Arabic, with many of them fluent or conversant in English. 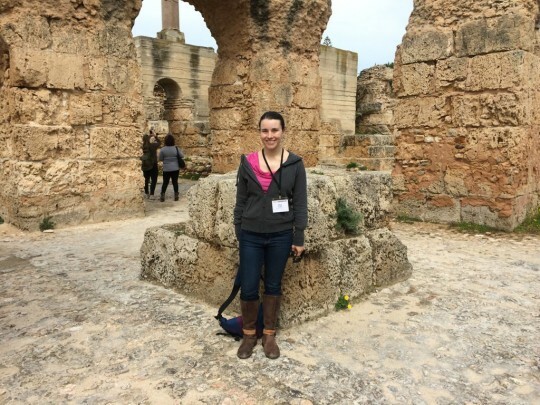 More than 60% of Tunisians have college degrees, and gender equity in STEM fields is much greater in Tunisia than in the U.S.
We dipped our toes into the history of Tunisia on the first day of our trip. The ancient city of Carthage (or, rather, the ruins thereof) is located a short drive from the capital city, Tunis. [Side note: when taking photos at Carthage, one must be careful not to point their camera toward the nearby presidential palace.] Our group visited parts of Carthage, spending a good bit of time wandering through the public baths and taking photos. We walked on and were awed by 3000+ year old mosaics and learned about the Punic, Phoenician, and Roman people who had called Tunisia home at the Bardo National Museum. There was much more to see, but we had to move on to walk through the Medina (old city), which is full of beautiful, colorful doors. Our main purpose was meeting Tunisians and having exchanges with them, scientific, technical, and cultural, and keeping ties with other program members strong. On our first day, our group visited a training session for the Women’s Enterprise for Sustainability program. We learned about the centers they have in locations throughout Tunisia and the ways they work with female entrepreneurs in their locales. Many of the women who use the centers are artisans, so members of our group hosted discussions about eCommerce, social media marketing, selling on Facebook, mentoring programs, and how to encourage innovation. It was fun to hear the insightful questions asked by the participants and to listen to the rapid interpretation between English, French, Tunisian, and Arabic. We also had an opportunity to purchase some crafts made by women entrepreneurs through the centers. The second day of our program was science day! We visited the Institut Pasteur de Tunis where one of our TechWomen Fellows is a bioinformatician. The director gave us a high level overview of the research programs at the Pasteur. We had three “keynotes” from members of our group. Katy talked about the impact of women on computer science. Larissa talked about Open Science, specifically what members of Mozilla are doing in that area. 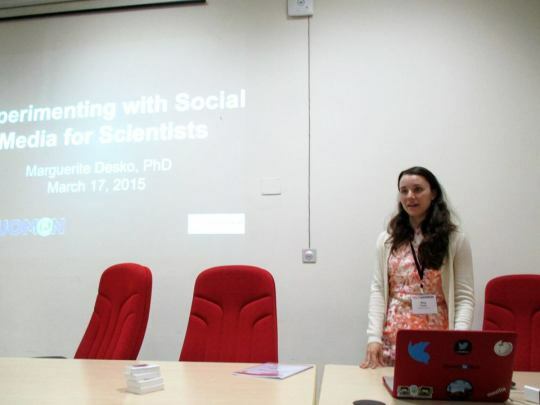 My keynote was titled “Experimenting with Social Media for Scientists,” and touched on different ways scientific researchers can leverage social media (Twitter! Facebook! ResearchGate!) to further their careers, network, and gain access to resources. During our coffee break [cultural note: Tunisian events often feature coffee breaks that feature coffee, incredible pastries, sweetened mint tea, and strawberry juice. Highly recommended. ], we networked with scientists from throughout Africa who were at the Pasteur for a bioinformatics course run by Amel, a Tunisian TechWomen Fellow. We then had several bioinformatics talks from scientists at the Institute discussing the genetic makeup of Tunisian people, diagnosing genetic diseases in resource-poor areas, and vaccine development in Tunisia. After delicious lunch (tagine! harissa!) at Hotel Africa, we headed to a Green Tech event hosted by Olfa, another TechWomen EL, and her Maya Organization. We learned about TEARN, a resource for teachers and heard business plan pitches for green tech companies from young Tunisians. The the event wrapped up with a panel of TechWomen mentors answering questions about green tech, renewable energy, and how to pursue your career dreams in the face of family and societal expectations. On the third day of the program, our group visited the Esprit Innovation Hub in Tunis to spend the day with high school girls interested in technology who were interested enough to join us during their school vacation week. Among the participants were two TechGirls participants and two soon-to-be TechGirls. Ines, one of last year’s Tech Girls, planned to demo her award-winning Android app. She was having difficulty with her development environment [Eclipse], was not working correctly [software engineers will not be surprised about this], so I was asked to help out. Ines, “my” TechWomen Fellow from 2014, Racha, and I spent a good bit of the next hour or so debugging Java to get her app working, succeeding right before lunch. 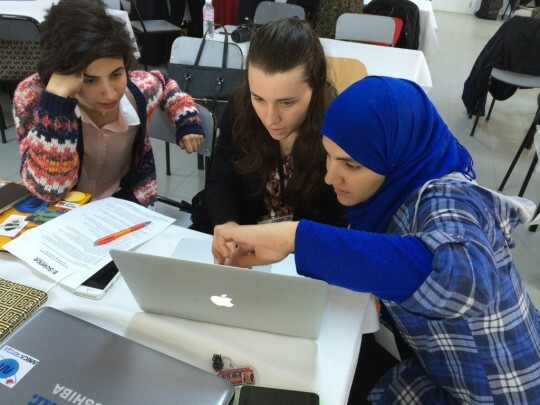 During that time, Sabine, a TechWomen Fellow from Lebanon ran workshops where the participants built cars, turned wood, and built circuits using kits she’d developed for her company Kids Genius to get young people excited about science and engineering. 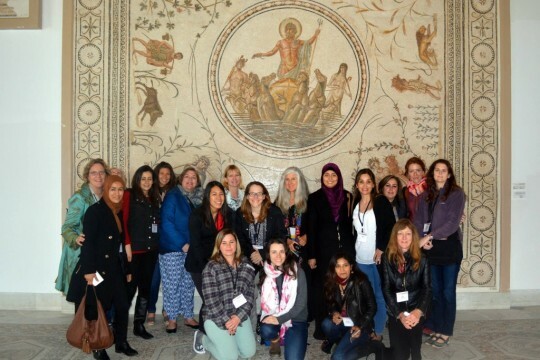 While we were enjoying a traditional Tunisian lunch with the girls and their teachers, our program leaders learned about the tragedy at the Bardo Museum and we returned to our hotel. Many of us spent time in the lobby between meetings to discuss the program, the remainder of which was cancelled. We also got to see Ines’s app, and took the “quiz” as a group, which was a bright spot in a confusing afternoon. Even though our delegation program was cancelled partway through our trip, I feel our trip was successful. 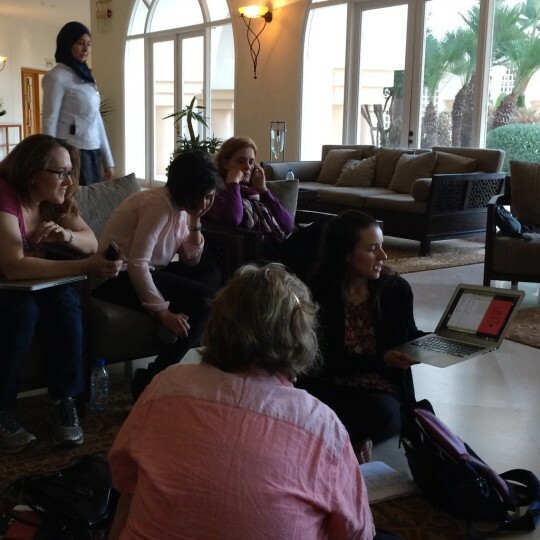 Our group discussed science and technology with Tunisian women and girls. We experienced Tunisian hospitality through the amazing Tunisian Emerging leaders [Thank you, Merci, Shukran], our wonderful tour guides, and other people we interacted with. We visited an incredible museum and saw the city filled with flags for Independence day. Yes, something terrible happened while we were in Tunisia, but the people who committed those crimes are not Tunisia. Tunisia is app developers and green entrepreneurs. It is scientists who are looking for the genetic basis of unusual diseases found in the South of the country. It is people who want to share their cultural heritage with visitors and girls who spend their break from school learning. Tunisia is small business owners learning how to market their goods and people running centers to help them. This small taste of Tunisia left me wanting more; to see more, to meet more lovely people, to eat more :-). 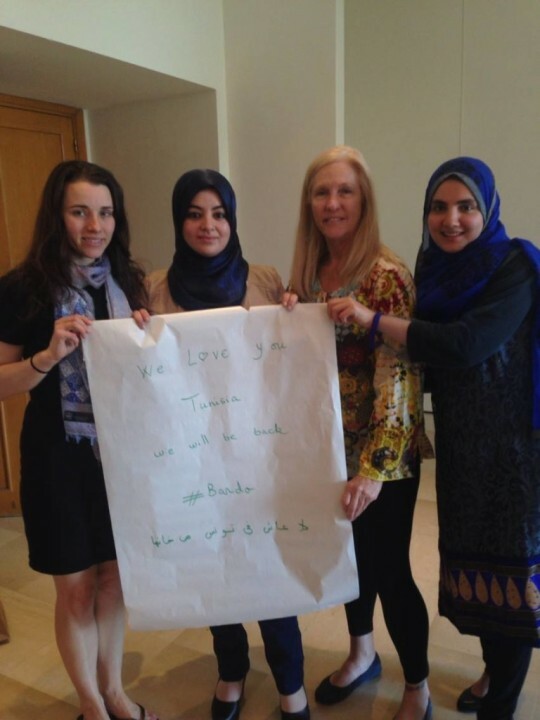 It also reminded me why TechWomen and exchange programs like it are so incredibly important. These taxpayer funded programs bring citizens from different countries and cultures together to learn about and from one another, to come together as human beings. They let us see how other people live, work, and play and to get a new perspective on life and the world we share. They let us understand Tunisia in a way that news reports about the Jasmine revolution and the Bardo Museum attack never could: through the eyes of people who live there. * TechWomen is a U.S. State Department exchange program that brings women from the Middle East, North Africa, Sub-Saharan Africa, and Central Asia to the San Francisco Bay Area for an internship at a science or technology company and immersion in the culture of Silicon Valley. During the program, the Emerging Leaders have two mentors: a professional mentor at their host company and a cultural mentor to do fun things with. The TechWomen program takes place in the fall; the following spring women from the bay area visit two of the countries participating in the program as a delegation. Originally posted on my blog, megdesko.com, home of an infrequently updated blog.